Trainer Jani is back with some thoughts about Protein- take it away, Jani! Protein is such a big buzz word in the fitness and nutrition industry. Are you consuming too much or too little and how much to you really need? Should you eat or drink your protein? Do you really need to add protein to EVERYTHING you eat? With all the hype about protein these days, you might think that we are at risk for a protein deficiency! However, contrary to what many supplement retailers want you to believe, with all the easily available sources of protein and the majority of Americans being meat eaters, a deficiency is highly unlikely. There are many different opinions on how much protein we actually need. Most official nutrition organizations recommend a fairly modest protein intake. The DRI (Dietary Reference Intake) is 0.8 grams of protein per kilogram of body weight, or 0.36 grams per pound. This amounts to approximately: 56 grams per day for the average sedentary man and 46 grams per day for the average sedentary woman. This amount is surely enough to prevent a protein deficiency but the jury is out whether or not this amount is enough to ensure optimal health and body composition. You need to take into consideration your activity level, age, muscle mass, physique goals and current state of health to determine how much protein you really need. 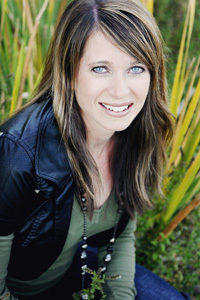 Karen Mangum, RD from Eagle, Idaho, recommends non-athletes need approximately 0.5 – 0.7 grams protein per pound body weight per day. (For a 150 pound person = 75 – 105 grams protein per day.) If you consider yourself an endurance or strength athlete, the recommendation is higher. For a great article on protein myths and recommendations for athletes, refer to Karen’s article here. Luckily, protein is prevalent in many foods you already eat and therefore it shouldn’t be a problem for most people to get in their daily requirements through a normal healthy diet. If you walk through the grocery store you will see an assortment of protein enriched cereal, granola bars, protein bars, etc. But the healthiest sources of protein are from whole foods, such as lean meats, milk, yogurt, cheese, cottage cheese, lentils, nuts and nut butters. 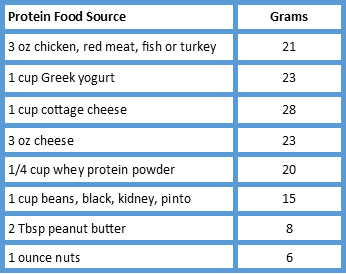 The following is a chart to give you an idea of how much protein is in some of these foods. If you aim for a goal of 20 grams of protein per meal and include a protein source in your snacks (i.e. cheese stick, nuts, peanut butter) you should be easily covered. While getting your protein sources through food is ideal, many people find that drinking a protein shake or adding protein powder to smoothies is a convenient way to help meet their daily requirements. Also, studies have shown that consuming a protein shake within 30 minutes of completing your workout is highly beneficial to help your body re-fuel and aid in the repair and regrowth of muscle tissue. I personally would not recommend more than one shake per day because you don’t want to miss out on all the fiber and other important nutrients that are available in food. Plus, getting your protein through food is more fulfilling and keeps you satisfied longer. Thanks for the great advice, Jani! We have another workout coming your way soon as well, so keep your eyes open for that one, coming soon! Great article. I am in the process of eliminating as much animal products from my diet as possible. So far eliminated all meat and diary (except the whey protein in my smoothie, fish and egg whites). I also cook all my meals, the main reason I am on your web site. Great information! I have to say the push for so much protein makes me crazy though! I suffer from kidney disease and I always cringe at how much protein some people take in because it is SO HARD on the kidneys and it is likely that at least some people have compromised kidney function and don’t even know it, as symptoms don’t show until end stage renal function. And like it was mentioned, most people do not have a deficiency. Everything in moderation, I say. So true Denise! Thank you for bringing that up! Hi Lynsie, for a post workout recovery shake, whey protein powder is recommended as it is absorbed quicker. So, how many grams of protein should we aim for, post-workout? Would it be different for a strength workout than for cardio? Your needs may be higher or lower depending on your activity level, body composition, gender, etc. But for the average woman, 20 grams post workout should be plenty. Do you have a brand of protein powder you like? I had a feeling I was going to get this question. 😉 There are so many brands and so many opinions out there as to which one is best. I personally drink a supplement shake called visalus. It has a combination of whey and soy protein, plus it has 30% of your daily vitamin and mineral requirements, plus added fiber. Honestly, I prefer this one because in my opinion it just tastes the best, and for me, taste is everything. 🙂 But there are so many out there, I would just try a few (preferably ones that have the least amount of artificial flavors and ingredients) and see which one you like the best. I agree that more protein isn’t better. I dislike that belief that is out there. Good article, thanks. I only eat plant protein and I feel like I have more energy than my days when I ate animal products. When people find out plants are my protein source, they are emotionally upset and then this question: Where do I get my protein? People are led to believe the best protein sources are steak, milk, eggs, and whey supplements. After watching Forks over Knives and reading The China Study, I believe we would all be more disease free if we opt to eat lower on the food chain and source our protein needs from healthy plant-based sources like black, kidney, pinto, and other beans, almonds, lentils, hemp seeds, spirulina, and quinoa. Even eating less-concentrated sources of protein like potatoes, sweet potatoes, and bananas will get us where we need to be. If we ate nothing but a variety of fresh fruit, we still would never suffer a deficiency of protein (or even any particular amino acid). Short of starving ourself, it’s almost impossible. Consider this: some of the fiercest animals in the world — the elephant, rhino, hippo and gorilla — are Plantpowered herbivores. And nobody asks them where they get their protein.